I'm sorry to tell you that the Corner Mark-It Tool is no longer commercially available. But I've been asked several times to show my corner binding technique to my local friends, so I'm going to show you too. 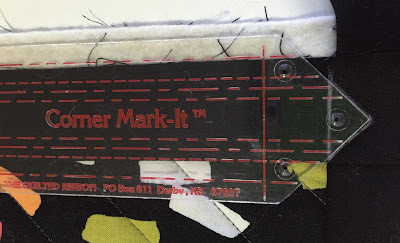 This tool is used to mark the corner of your binding so that you get a wonderful and perfect sewn mitered corner. I've been using it for years to sew at least one corner of my bindings, and sometimes all 4 corners. 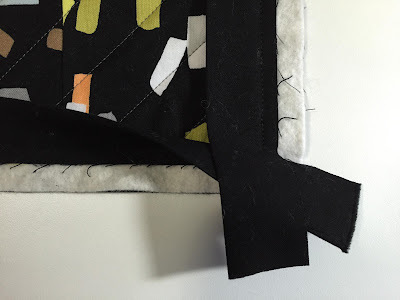 You see, I just don't like the method of starting and stopping in the middle of a side, then fiddling to get that seam to be in the perfect spot and trying to wrestle the quilt and binding under the machine. What I usually do is to start and stop at one of the corners, leaving only a 2" tail (instead of the 10" required on the side). 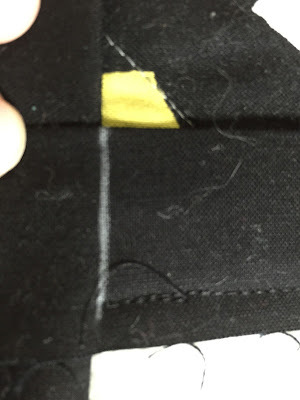 I sew up to the second corner, fold it and continue on with corners #3 and #4, ending again at the same place where I started, leaving a 2" tail at the first corner (now the last corner too). Here's where the magic happens. 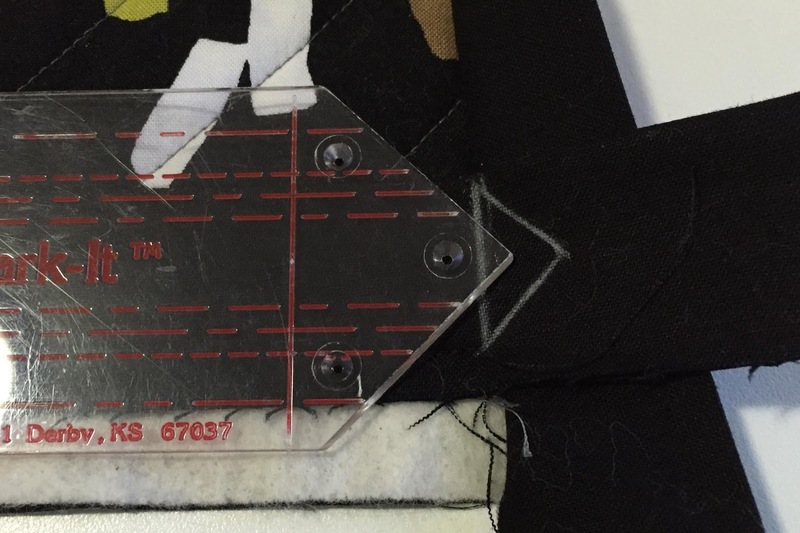 I use the Corner Mark-It tool to mark the little triangles and then sew the triangles together. I first make a line where the stitching ends and where it meets the opposite binding seam (see below). Then I line up the lines of the tool with the (1) fold line of the binding and (2) the seam line where the binding is attached. This centers the tool on the binding. Then I draw around the pointy edge to form a little triangle. Then I draw a little triangle on the other binding, line up the triangles and sew them together on the pointy part only, and trim. This gives me a nice crisp sewn mitered corner. (see by earlier blog on this step). Since you won't be able to buy the tool now, here's all you need to do. Get a piece of heavy clear plastic. Draw markings as shown in the first picture. The 1/4" lines are 1/2" apart; 1/2" are 1" apart, etc. The holes and the vertical line don't need to be copied. Cut it out carefully. Then use it just like the Corner Mark-It tool. I've made a few out of template plastic, and although this works, it's hard to see the stitching line. So find some heavy clear plastic and get going on making your own corner binding tool. I see how it works. . .pretty cool. I have a sort of like ruler; but, the technique is different. I wasn't able to get consistent results. Hmmm maybe I should dig it out and see if that "triangle" would help me find the consistency that I lacked!